Charles I (November 19, 1600 – January 30, 1649) was King of England, King of Scotland, and King of Ireland from March 27, 1625 until his execution in 1649. He famously engaged in a struggle for power with the Parliament of England. As he was an advocate of the Divine Right of Kings, many in England feared that he was attempting to gain absolute power. There was widespread opposition to many of his actions, especially the levying of taxes without Parliament's consent. Religious conflicts permeated Charles's reign. He married a Catholic princess, Henrietta Maria, over the objections of Parliament and public opinion. Charles further allied himself with other controversial religious figures, including the ecclesiastic Richard Montagu and William Laud, whom Charles appointed Archbishop of Canterbury. Laud produced changes in the liturgy of the Church of England which many of Charles's subjects felt brought the Church of England too close to Roman Catholicism. Charles's later attempts to force religious reforms upon Scotland led to war that weakened England and helped precipitate his downfall. 3 Tyranny or Personal Rule? The last years of Charles's reign were marked by the English Civil War, in which he was opposed by the forces of Parliament—they challenged his attempts to augment his own power—and by Puritans, who were hostile to his religious policies and apparent Catholic sympathy. The first Civil War (1642–1645) ended in defeat for Charles, after which the parliamentarians expected him to accept their demands for a constitutional monarchy. Instead, he remained defiant, provoking a second Civil War (1648–1649). This was considered unacceptable, and Charles was subsequently tried, convicted, and executed for high treason. The monarchy was then abolished and a republic called the Commonwealth of England was declared. Charles's son, Charles II, became king after restoring the monarchy in 1660. Charles is also the only person to be canonized by the Church of England since the English Reformation. The second son of James VI, King of Scots and Anne of Denmark, Charles was born at Dunfermline Palace, Fife, on November 19, 1600. He was an underdeveloped child (he is listed in the Guinness Book of Records as the nation's shortest king) who was still unable to walk or talk at the age of three. When Elizabeth I died in March 1603 and James VI became King of England as James I, Charles was originally left in Scotland in the care of nurses and servants because it was feared that the journey would damage his fragile health. He did make the journey in July 1604 and was subsequently placed under the charge of Alletta (Hogenhove) Carey, the Dutch-born wife of courtier Sir Robert Carey, who taught him how to walk and talk and insisted that he wear boots made of Spanish leather and brass to help strengthen his weak ankles. As an adult Charles was 5 feet 4 inches (162 cm) tall. Charles was not as well-regarded as his elder brother, Henry Frederick Stuart, Prince of Wales; Charles himself adored Henry and tried to emulate him. In 1605, as was then customary in the case of the Sovereign's second son, he was made Duke of York in England. Two years before, in 1603, he was made Duke of Albany in Scotland. When his elder brother died of typhoid in 1612, Charles became heir apparent and was subsequently made the Prince of Wales and Earl of Chester in November 1616. His sister Elizabeth married in 1613 to Frederick V, Elector Palatine and moved to Heidelberg. The new Prince of Wales was greatly influenced by his father's favorite courtier, George Villiers, First Duke of Buckingham, who took him on an expedition to Spain in 1623 to look for a suitable bride, and settled on the daughter of the Spanish King Philip III, Infanta Maria Anna of Spain. No marriage occurred, however, as the Spanish demanded the Prince of Wales's conversion to Roman Catholicism. Upon their return in October, both the Prince of Wales and the Duke of Buckingham demanded that James I declare war on Spain. With the encouragement of his Protestant advisors, James summoned Parliament so that he could request subsidies for his war effort. James also requested that Parliament sanction the marriage between the Prince of Wales and Princess Henrietta Maria of France, whom Charles met in Paris while en route to Spain. It was a good match since she was a sister of Louis XIII (their father, Henry IV of France, had died during Henrietta Maria’s childhood). Parliament agreed to the marriage, but was extremely critical of the prior attempt to arrange a marital alliance with Spain. James was growing senile and as a result was finding it extremely difficult to control Parliament—the same problem would later haunt Charles during his reign. During the last year of his reign, actual power was held not by him but by his eldest son and the Duke of Buckingham. Distrust of Charles's religious policies was increased by the controversy surrounding the ecclesiastic Richard Montagu. In a pamphlet, Montagu argued against the teachings of John Calvin, immediately bringing himself into disrepute amongst the Puritans. A Puritan member of the House of Commons, John Pym, attacked Montagu's pamphlet during debate, prompting Montagu to request the aid of Charles I in a pamphlet entitled Appello Caesarem (Latin "I appeal to Caesar," a reference to an appeal against Jewish persecution made by Saint Paul the Apostle). Charles I offered the cleric his protection, leading many Puritans to take a hostile view toward him. Charles's primary concern during his early reign was foreign policy. Frederick V, Elector Palatine, his sister Elizabeth's husband, had lost his hereditary lands in the Electoral Palatinate to the Holy Roman Emperor Ferdinand II, leading to the Thirty Years' War. Originally only a war to keep the Catholic Habsburgs hegemonic as the elected Kings of Bohemia, it spiraled out of control into a civil and confessional war between Protestants and Catholics in Europe. Charles was committed to help his brother-in-law regain the Palatinate by waging a war with the Catholic Spanish King Philip IV, whom he hoped he could force to intercede with the Emperor on his behalf. Parliament preferred an inexpensive naval attack on Spanish colonies in the New World, hoping that the capture of the Spanish treasure fleets could finance the war. Charles, however, preferred more aggressive (and more expensive) action on the Continent. Parliament only voted to grant a subsidy of £140,000; an insufficient sum for Charles. Moreover, the House of Commons agreed to allow the king to collect tonnage and poundage (two varieties of customs duties), but only for a period of one year, although previous Sovereigns since 1414 had been granted the right for life. In this manner, the House of Commons hoped to keep a check on Charles's power by forcing him to seek the renewal of the grant each year. Charles's allies in the House of Lords, led by the Duke of Buckingham, refused to pass the bill. Although no Parliamentary authority for the levy of tonnage and poundage could be obtained, Charles continued to collect the duties anyway. In January 1629 Charles opened the second session of the Parliament which had been prorogued in June 1628. Charles saw a conspiracy at work, due to the recent assassination of Buckingham, calling his commons “seditious.” Members of the House of Commons began to voice their opposition in light of the Rolle case. Rolle was an MP who had his goods confiscated for not paying tonnage and poundage. This was seen by many MPs as a breach of the Petition of Right, who argued that the freedom from arrest privilege extended to goods. When he requested a parliamentary adjournment in March, members held the Speaker, John Finch, down in his chair while three resolutions against Charles were read aloud. The last of these resolutions declared that anyone who paid tonnage or poundage not authorized by Parliament would "be reputed a betrayer of the liberties of England, and an enemy to the same." Though the resolution was not formally passed, many members declared their approval. The fact that a number of MPs had to be detained in Parliament is relevant in understanding that there was no universal opposition toward the king. Afterward, when the Commons passed further measures displeasing to Charles, he dissolved parliament. Charles resolved not to be forced to rely on Parliament for further monetary aid. Immediately, he made peace with France and Spain. 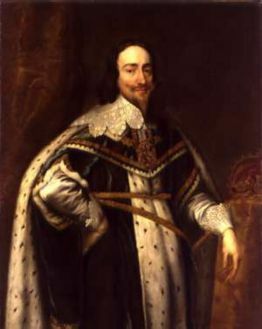 The following 11 years, during which Charles ruled without a Parliament, have been known as both the Eleven Years’ Tyranny and simply as the Personal Rule. (Charles's rule without Parliament constituted a valid but nevertheless exceptional exercise of the royal prerogative. In former times such rule would have been considered just but by the middle of the seventeenth century it was held by many to be an exercise of absolute power). Sir Anthony van Dyck, Charles I's court painter, created the famous Charles I, King of England, from Three Angles, commonly known as the Triple Portrait. This oil painting, done around 1636, was created so that the Italian sculptor, Bernini, could create a marble bust of Charles. Even without Parliament Charles still had to acquire funds in order to maintain his treasury. Thus, relying on an all but forgotten feudal statute called “The Distraint of Knighthood” passed in 1278, requiring anyone who earned £40 or more each year to present himself at the King's coronation so that he may join the royal army as a knight, Charles fined all individuals who failed to attend his coronation in 1626. He also reintroduced the obsolete feudal tax known as ship money which was even more unpopular. A writ issued in 1634 ordered the collection of ship money in peacetime, notwithstanding statutes of Edward I and Edward III that had prohibited the levying of such a tax except during wars. This first writ of 1634, however, did not encourage much opposition on legal grounds, but a second writ of 1635 did. Charles's third writ demanding ship money, issued in 1636, made it clear that the ancient prohibition on collecting ship money during peacetime had been swept away. Many attempted to resist payment, but Charles's judges, whose tenure depended on his "good pleasure," declared that the tax was within the king's prerogative. This action of demanding ship money to be raised in peacetime was a major cause of concern among the ruling class; however, it must be noted that it was the attempted enforcement of the Anglican and increasingly Arminian styled prayer book under Laud that precipitated the rebellion in Scotland, which ended Personal Rule in 1640. Charles wished to move the Church of England away from Calvinism in a more traditional and sacramental direction. This goal was shared by his main political adviser, Archbishop William Laud. Laud was appointed by Charles as the Archbishop of Canterbury in 1633 and started a series of unpopular reforms in the Church to make it more ceremonial. Laud attempted to ensure religious uniformity by dismissing non-conformist clergymen and closing Puritan organizations. This was actively hostile to the Reformist tendencies of many of Charles’s English and Scottish subjects. His policy was obnoxious to Calvinist theology, and insisted that the Church of England's liturgy be celebrated with all of the ceremony and vestments called for by the Book of Common Prayer. Laud was also an advocate of Arminian theology, a view in which emphasis on the ability to reject salvation was viewed as heretical and virtually "Catholic" by strict Calvinists. To punish those who refused to accept his reforms, Laud used the two most feared and arbitrary courts in the land, the Court of High Commission and the Court of Star Chamber. The former could compel individuals to provide self-incriminating testimony, while the latter could inflict any punishment whatsoever (including torture), with the sole exception of death. The lawlessness of the Court of Star Chamber under Charles I far exceeded that under any of his predecessors. Under Charles's reign, defendants were regularly hauled before the court without indictment, due process of the law, or the right to confront witnesses, and their testimonies were routinely extracted by the king and his courtiers through extensive torture. The first years of the Personal Rule were marked by peace in England, to some extent due to tighter central control. Several individuals opposed Charles's taxes and Laud's policies, but the overall trend of the early Personal Rule period is one of peace. When, however, Charles attempted to impose his religious policies in Scotland, he faced numerous difficulties. The king ordered the use of a new Prayer Book modeled on the English Book of Common Prayer, which, although supported by the Scottish Bishops, was resisted by many Presbyterian Scots, who saw the new Prayer Book as a vehicle for introducing Anglicanism to Scotland. When the General Assembly of the Church of Scotland abolished Episcopalian government (that is, governance of the Church by Bishops) in 1638, replacing it with Presbyterian government (that is, governance by Elders and Deacons), Charles sought to put down what he saw as a rebellion against his authority. In 1639, when the First Bishops' War broke out, Charles sought to collect taxes from his subjects, who refused to yield any further. Charles's war ended in a humiliating truce in June of the same year. In the Pacification of Berwick, Charles agreed to grant his Scottish subjects civil and ecclesiastical freedoms. Charles's military failure in the First Bishops' War in turn caused a financial and military crisis for Charles, leading to the end of Personal Rule. Due to his financial weakness, Charles was forced to call Parliament into session by 1640 in an attempt to raise funds. While the ruling class grievances with the changes to government and finance during the Personal Rule period were a contributing factor in the Scottish Rebellion, it was mainly due to the key issue of religion that Charles was forced to confront the ruling class in Parliament for the first time in 11 years. In essence, it was Charles's and Laud's confrontational religious modifications that ended what the Whig historians refer to as "The Eleven Years of Tyranny." Disputes regarding the interpretation of the peace treaty between Charles and the Church of Scotland led to further conflict. To subdue the Scots, Charles needed more money; therefore, he took the fateful step of recalling Parliament in April 1640. Although Charles offered to repeal ship money, and the House of Commons agreed to allow Charles to raise the funds for war, an impasse was reached when Parliament demanded the discussion of various abuses of power during the Personal Rule. As both sides refused to give ground on this matter, Parliament was dissolved in May 1640, less than a month after it assembled. Thus, the Parliament became known as the "Short Parliament." Equestrian portrait of Charles I with Seignior de St Antoine by Sir Anthony van Dyck. 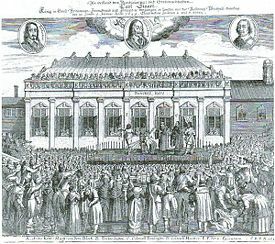 The Long Parliament assembled in November 1640 under the leadership of John Pym, and proved just as difficult for Charles as the Short Parliament. Although the members of the House of Commons thought of themselves as conservatives defending the king, Church, and Parliamentary government against innovations in religion and the tyranny of Charles's advisors, Charles viewed many of them as dangerous rebels trying to undermine his rule. To prevent the king from dissolving it at will, Parliament passed the Triennial Act, to which the Royal Assent was granted in February 1641. The Act required that Parliament was to be summoned at least once every three years, and that if the king failed to issue proper summons, the members could assemble on their own. In May, he assented to an even more far-reaching act, which provided that Parliament could not be dissolved without its own consent. Charles was forced into one concession after another. He agreed to bills of attainder authorizing the executions of Thomas Wentworth and William Laud. Ship money, fines in destraint of knighthood and forced loans were declared unlawful, and the hated Courts of Star Chamber and High Commission were abolished. Although he made several important concessions, Charles improved his own military position by securing the favor of the Scots. He finally agreed to the official establishment of Presbyterianism; in return, he was able to enlist considerable anti-parliamentary support. In November 1641 the House of Commons passed the Grand Remonstrance, denouncing all the abuses of power Charles had committed since the beginning of his reign. The tension was heightened when the Irish rebelled against Protestant English rule and rumors of Charles's complicity reached Parliament. An army was required to put down the rebellion but many members of the House of Commons feared that Charles might later use it against Parliament itself. The Militia Bill was intended to wrest control of the army from the king, but Charles refused to agree to it. However, Parliament decreed the Protestation as an attempt to lessen the conflict. When rumors reached Charles that Parliament intended to impeach his Catholic Queen, Henrietta Maria, he took drastic action. His wife persuaded him to arrest the five members of the House of Commons who led the anti-Stuart faction on charges of high treason, but, when the king had made his decision, she made the mistake of informing a friend who in turn alerted Parliament. Charles entered the House of Commons with an armed force on January 4, 1642, but found that his opponents had already escaped, he inquired to the Speaker, William Lenthall, as to their whereabouts, to which Lenthall famously replied: "May it please your Majesty, I have neither eyes to see nor tongue to speak in this place but as the House is pleased to direct me, whose servant I am here." By violating Parliament with an armed force, Charles made the breach permanent. Many in Parliament thought Charles's actions outrageous as did the corporation and City of London which moved firmly behind Parliament. Charles no longer felt safe in London and he went north to raise an army against Parliament. The Queen, at the same time, went abroad to raise money to pay for it. The English Civil War had not yet started, but both sides began to arm. After futile negotiations, Charles raised the royal standard (an anachronistic medieval gesture) in Nottingham on August 22, 1642. He then set up his court at Oxford, whence his government controlled roughly the north and west of England, with Parliament remaining in control of London and the south and east. Charles raised an army using the archaic method of the Commission of Array. The Civil War started on October 25, 1642 with the inconclusive Battle of Edgehill and continued indecisively through 1643 and 1644, until the Battle of Naseby tipped the military balance decisively in favor of Parliament. There followed a great number of defeats for the Royalists, and then the Siege of Oxford, from which Charles escaped in April 1646. He put himself into the hands of the Scottish Presbyterian army at Newark, England, and was taken to nearby Southwell, Nottinghamshire while his "hosts" decided what to do with him. The Presbyterians finally arrived at an agreement with Parliament and delivered Charles to them in 1647. He was imprisoned at Holdenby House in Northamptonshire, until cornet George Joyce took him by force to Newmarket in the name of the New Model Army. At this time, mutual suspicion had developed between the New Model Army and Parliament, and Charles was eager to exploit it. He was transferred first to Oatlands and then to Hampton Court Palace, where more involved but fruitless negotiations took place. He was persuaded that it would be in his best interests to escape—perhaps abroad, perhaps to France, or perhaps to the custody of Colonel Robert Hammond, Parliamentary Governor of the Isle of Wight. He decided on the last course, believing Hammond to be sympathetic, and fled on November 11. Hammond, however, was opposed to Charles, whom he confined in Carisbrooke Castle. From Carisbrooke, Charles continued to try to bargain with the various parties, eventually coming to terms with the Scottish Presbyterians that he would allow the establishment of Presbyterianism in England as well as Scotland for a trial period. The Royalists rose in July 1648 igniting the Second Civil War, and as agreed with Charles the Scots invaded England. Most of the uprisings in England were put down by forces loyal to Parliament after little more than skirmishes, but uprisings in Kent, Essex, and Cumberland, the rebellion in Wales, and the Scottish invasion involved the fighting of pitched battles and prolonged sieges. But with the defeat of the Scots at the Battle of Preston (1648), the Royalists lost any chance of winning the war. Charles was moved to Hurst Castle at the end of 1648, and thereafter to Windsor Castle. In January 1649 in response to Charles's defiance of Parliament even after defeat, and his encouraging the second Civil War while in captivity, the House of Commons passed an Act of Parliament creating a court for Charles's trial. After the first Civil War, the Parliamentarians still accepted the premise that the king, although wrong, had been able to justify his fight, and that he would still be entitled to limited powers as king under a new constitutional settlement. It was now felt that by provoking the second Civil War even while defeated and in captivity, Charles showed himself incorrigible, dishonorable, and responsible for unjustifiable bloodshed. The idea of trying a king was a novel one; previous monarchs had been deposed, but had never been brought to trial as monarchs. The High Court of Justice established by the act consisted of 135 Commissioners (all firm Parliamentarians). The prosecution was led by Solicitor General John Cook. Charles’s trial on charges of high treason and "other high crimes" began on January 20, 1649, but Charles refused to enter a plea, claiming that no court had jurisdiction over a monarch. He believed that his own authority to rule had been given to him by God when he was crowned and anointed, and that the power wielded by those trying him simply grew out of a barrel of gunpowder. The court, by contrast, proposed that no man is above the law. Over a period of a week, when Charles was asked to plead three times, he refused. It was then normal practice to take a refusal to plead as pro confesso: an admission of guilt, which meant that the prosecution could not call witnesses to its case. However, the trial did hear witnesses. On January 29, 1649 59 of the Commissioners signed Charles's death warrant. After the ruling, he was led from St. James's Palace, where he was confined, to the Palace of Whitehall, where an execution scaffold had been erected in front of the Banqueting House. This contemporary German print depicts Charles I's decapitation. When Charles was beheaded on January 30, 1649, it is reputed that he wore a heavy cotton shirt as to prevent the cold January weather causing any noticeable shivers that the crowd could have been mistaken for fear or weakness. He put his head on the block after saying a prayer and signaled the executioner he was ready; he was then beheaded with one clean stroke. Phillip Henry records that moments after the execution, a moan was heard from the assembled crowd, some of whom then dipped their handkerchiefs in his blood, thus starting the cult of the Martyr King. However, no other eyewitness sources, including that of Samuel Pepys, record this. Henry's account was written during the Restoration, some 12 years after the event. Henry was 19 when the king was executed and he and his family were Royalist propaganda writers. There is some debate over the identity of the man who beheaded the king, for the executioner was masked at the scene. It is known that the Commissioners approached Richard Brandon, the common Hangman of London, but that he refused, and contemporary sources do not generally identify him as the king's headsman. Ellis's Historical Inquiries, however, names him as the executioner, contending that he stated so before dying. It is possible he relented and agreed to undertake the commission, but there are others who have been identified. An Irishman named Gunning is widely believed to have beheaded Charles, and a plaque naming him as the executioner is on show in Galway, Ireland. William Hewlett was convicted of regicide after the Restoration. In 1661 two people identified as "Dayborne and Bickerstaffe" were arrested but then discharged. Henry Walker, a revolutionary journalist, or his brother William, were suspected but never charged. Various local legends around England name local worthies. An examination performed in 1813 at Windsor suggests that the execution was done by an experienced headsman. It was common practice for the head of a traitor to be held up and exhibited to the crowd with the words "Behold the head of a traitor!" Although Charles's head was exhibited, the words were not used. In an unprecedented gesture, one of the revolutionary leaders, Oliver Cromwell, allowed the king's head to be sewn back on his body so the family could pay its respects. Charles was buried in private and at night on February 7, 1649, in the Henry VIII’s vault inside St George's Chapel in Windsor Castle. The king's son, King Charles II, later planned an elaborate royal mausoleum, but it was never built. Ten days after Charles's execution, a memoir purporting to be from Charles's hand appeared for sale. This book, the Eikon Basilike (Greek: the "Royal Portrait"), contained an apologia for royal policies, and proved an effective piece of Royalist propaganda. William Levett, Charles's groom of the bedchamber, who had accompanied Charles on the day of his execution, would later swear in a statement that he had witnessed the king writing the Eikon Basilike. John Cooke published the speech he would have delivered if Charles had entered a plea, while Parliament commissioned John Milton to write a rejoinder, the Eikonoklastes ("The Iconoclast"), but the response made little headway against the pathos of the Royalist book. Various prodigies were recorded in the contemporary popular press in relation to the execution—a beached whale at Dover died within an hour of the king, a falling star appeared that night over Whitehall, and a man who had said that the king deserved to die had his eyes pecked out by crows. 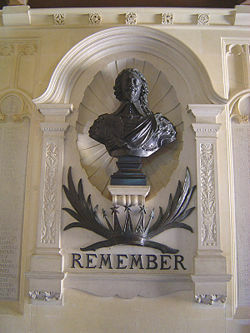 Memorial to Charles I at Carisbrooke Castle, Isle of Wight. With the monarchy overthrown, power was assumed by a Council of State, which included Oliver Cromwell, then Lord General of the Parliamentary Army. The Long Parliament (known by then as the Rump Parliament) which had been called by Charles I in 1640 continued to exist until Cromwell forcibly disbanded it in 1653. Cromwell then became Lord Protector of England, Scotland, and Ireland; a monarch in all but name: he was even "invested" on the royal coronation chair. Upon his death in 1658, Cromwell was briefly succeeded by his son, Richard Cromwell. Richard Cromwell was an ineffective ruler, and the Long Parliament was reinstated in 1659. The Long Parliament dissolved itself in 1660, and the first elections in 20 years led to the election of a Convention Parliament which restored Charles I's eldest son to the monarchy as Charles II. Upon the Restoration, Charles II added a commemoration of his father—to be observed on January 30, the date of his execution—to the Book of Common Prayer. In the time of Queen Victoria this was however removed due to popular discontent with the commemorating of a dead monarch with a major feast day of the Church; now, January 30 is only listed as a "Lesser Festival." There are several Anglican/Episcopal churches dedicated to Charles I as "King and Martyr" in England, Canada, Australia, and the United States. The Society of King Charles the Martyr was established in 1894 by Mrs. Greville-Negent, assisted by Fr. James Fish, rector of St. Margaret Pattens, London. The objectives of the SKCM include prayer for the Church of England and the Anglican Communion, promoting a wider observance of January 30 in commemoration of Charles's "martyrdom," and the reinstatement of his feast day in the Book of Common Prayer. King Charles is regarded as a martyr by some Anglicans for his notion of "Christian Kingship," and as a "defender of the Anglican faith." The Colony of Carolina in North America was named for Charles I. Carolina later separated into North Carolina and South Carolina, which eventually declared independence from England during the formation of the United States. To the north in the Virginia Colony, Cape Charles, the Charles River, Charles River Shire, and Charles City Shire were named for him. Charles City Shire survives almost four hundred years later as Charles City County, Virginia. The Virginia Colony is now the Commonwealth of Virginia (one of the four U.S. states that are called commonwealths), and retains its official nickname of "The Old Dominion" bestowed by Charles II because it had remained loyal to Charles I during the English Civil War. The official style of Charles I was "Charles, by the Grace of God, King of England, Scotland, France and Ireland, Defender of the Faith, etc." (The claim to France was only nominal, and was asserted by every English King since Edward III, regardless of the amount of French territory actually controlled.) The authors of his death warrant, however, did not wish to use the religious portions of his title. It only referred to him as "Charles Stuart, King of England." 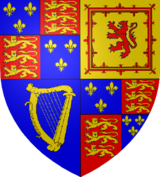 Whilst he was king, Charles I's arms were: Quarterly, I and IV Grandquarterly, Azure three fleurs-de-lis Or (for France) and Gules three lions passant guardant in pale Or (for England); II Or a lion rampant within a tressure flory-counter-flory Gules (for Scotland); III Azure a harp Or stringed Argent (for Ireland). 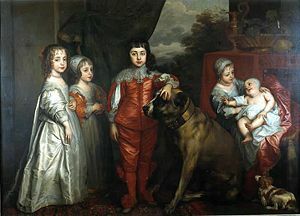 Painting of Charles I's children. The future Charles II is depicted at center, stroking the dog. Charles was father to a total of nine legitimate children, two of whom would eventually succeed him as king. Several other children died in childhood. Charles is also believed to have had a daughter prior to his marriage with Henrietta Maria. Her name was Joanna Brydges, born 1619-1620, the daughter of a Miss Brydges ("a member of a younger branch of the ancient Kentish family of that name"), possibly from the line of Brydges of Chandos and Sudeley. Joanna Brydges, who was provided for by the estate of Mandinam, Carmarthenshire, was brought up in secrecy at Glamorgan, Wales. She went on to become second wife to Bishop Jeremy Taylor, author of "Holy Living" and "Holy Dying" and chaplain to both Archbishop Laud and Charles I. The Bishop and his wife Joanna Brydges left for Ireland, where Jeremy Taylor became Bishop of Down, Connor, and Dromore in 1660. Joanna Brydges and Jeremy Taylor had several children, including two daughters, Joanna Taylor (Harrison) and Mary Taylor (Marsh). Charles James, Duke of Cornwall March 13, 1629 March 13, 1629 Stillbirth. Charles II, King of England May 29, 1630 February 6, 1685 Married Catherine of Braganza (1638–1705) in 1663. No legitimate issue. Believed to have fathered such illegitimate children as James Scott, First Duke of Monmouth, who later rose against James II. 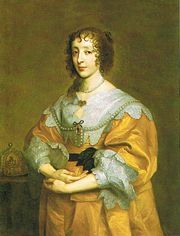 Mary, Princess Royal November 4, 1631 December 24, 1660 Married William II, Prince of Orange (1626–1650) in 1648. Had issue. Elizabeth, Princess of England December 29, 1635 September 8, 1650 No issue. Anne, Princess of England March 17, 1637 December 8, 1640 No issue. Henry, Duke of Gloucester July 8, 1640 September 18, 1660 No issue. ↑ Murphy, Derrick, ed., Britain 1558-1689. (London: HarperCollins Publishers, 2002.) pp.211-235. ↑ Journal of the House of Lords, Message from the King; on His Escape from Hampton Court, that He will appear again if He can be heard, and will give Satisfaction. Retrieved August 13, 2007. ↑ Journal of the House of Lords, Letter from Colonel Hammond, that he has ordered, no Persons shall come in or go out of the Isle of Wight without his Pass;—and desiring the King's former Allowance may be continued to Him. Retrieved August 13, 2007. ↑ Rushworth, J., and Lockyer, R., ed., The Trial of King Charles I. 1959. pp.133-134. ↑ Axtell Family Organization, Selections from the Trial and Execution of Col. Daniel Axtell in October 1660. Retrieved August 13, 2007. ↑ Hartigan, Rev. Allen Stewart, The Family of Pollock of Newry and Descendants. Retrieved August 13, 2007; Wheaton College, A Sketch of the Life and Times of Bishop Taylor. Retrieved August 13, 2007; Kiefer, James, Jeremy Taylor, Bishop and Theologian (13 August 1667). Retrieved August 13, 2007. Kishlansky, Mark A. "Charles I: A Case of Mistaken Identity." Past and Present. no. 189. Nov. 2005. pp. 41–80. History of the Monarchy. Charles I. The Society of King Charles the Martyr. The Society of King Charles the Martyr. 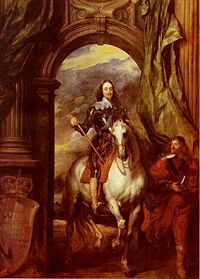 History of "Charles I of England"
This page was last modified on 3 February 2017, at 15:38.